Last Thursday, TAM released a cautiously optimistic report (PDF) on implementing bike sharing in Marin. The preliminary report’s caution is well-warranted, as the county’s infrastructure and urban form are far different from bike share pioneers Paris and Washington, DC. If Marin can thread the needle and create a quality bike share program, it could be a pioneer for other suburbs. Bike share, the system examined by TAM, is a bicycle rental/transit hybrid. Bikes are stored in stations, like the one pictured at right, which are scattered through the area. Users purchase a membership for a certain amount of time, usually just a day, week, month, or year. While a member, users can pick up a bike from any station and drop it off at any other station. If done within a certain time, like 30 minutes, the trip is free. If the trip goes over that time limit, a fee is levied for every subsequent half-hour. The point isn’t to check out a bike for a round-trip but rather for each short leg of a short journey. Want to get from downtown MillValley to Whole Foods? Check out a bike, ride it to Whole Foods, dock it there and do your shopping. After you’re done, check out another bike from the station and ride it back downtown or wherever you want to go next. I’ve been a member of the Washington, DC, system for most of the time it’s been active. 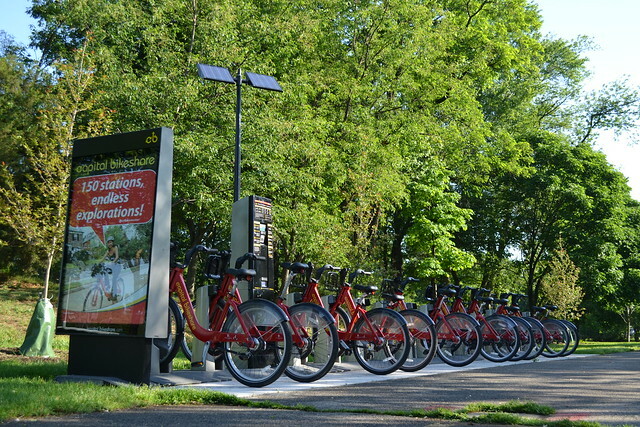 Capital Bikeshare, or CaBi, is used by tourists to get between museums on the National Mall, commuters to get to work, revelers to get around after the Metro system closes, and for general trips around town. I’ve used it for all those purposes and it works great for all of them. The key is to have bicycles and docks always available at a given station, and to have stations conveniently located. There’s nothing worse than arriving at a station to find the bikes are all gone or to find there’s nowhere to dock your bike, especially if there’s nowhere nearby that does have a bike or dock. The company contracted to operate the system will “rebalance” the bikes from one station to the other. In DC, the operator pays a fee if any station is empty or full for more than two hours. Users know where bikes, docks, and stations are by looking at screens on the stations or with a smartphone app. TAM wants a bike share system to serve primarily the commuting public, to solve what transit planners call the Last Mile Problem. When a rider hops off a bus, they’re at a location that might a ways away from their final destination. To get to the final destination, riders typically walk, though bikes are a common sight on Marin’s bus fleet. With bike share, a rider doesn’t need to bring their own bike. With that in mind, the first stations would be focused on moving people from downtowns to ferry terminals and transit centers. Twelve stations, one in most of the downtowns and one at the two ferry terminals, would provide a way to get commuters around the county. Subsequent phases would make more stations around activity centers, which would make the system more like CaBi. Total cost would be around $720,000 for the first phase and $2.2 million for full build-out. A major barrier to the success of the bike share system will be the paucity of quality bike facilities between downtowns and activity centers. Though it is possible to ride through most of Marin, it isn’t always pleasant, and the safest route is sometimes far out of the way. Between most downtown pairs lies a few miles of bike-hostile arterial roads. Though most have safer parallel routes, those parallel routes don’t access the businesses that grew up along the arterial. Since bike share is a utility rather than leisure system, the separation of businesses and bike routes diminishes just how much utility bikers can get from the system. Given how low density Marin’s origins and destinations already are, the last thing we need is to diminish separate bikes from businesses. Marin’s demographics are another potential obstacle. The foundation of most bike share systems is the 25-34 age group. Though they’ve been growing in Marin, the group is a fraction of the size it is in DC or San Francisco. Planners want to harness the 35-45 age group instead, though they’ve been reticent about adopting bike share elsewhere. The bike share report seems to underestimate the power of tourists in Marin. Particularly in Sausalito, a major driver of use will be tourists. DC’s system was never designed for tourists, but once the system opened on the National Mall the bikes became ubiquitous. Sausalito already gets thousands of tourists. If Marin’s system is integrated with San Francisco’s quite delayed plan, I suspect a huge number of tourists and day trippers will use bike share to hang out around Sausalito and Tiburon. As well, commuters to the City will be able to use their bike share membership at home and for their commute, taking away some of the demand for bike space on ferries and buses. Bike share is its own best advertiser. Once a small system is up and running, demand springs up elsewhere. People, even transit-savvy New Yorkers, often don’t understand what bike share does before it’s active, but once it is people know it and love it. Richmond, Novato, and maybe even the closer-in West Marin villages like Bolinas and Stinson will want in on the action. As a nifty indirect effect, bike share puts people in touch with the infrastructure in their communities. A street looks different from a bike. What feels like a narrow lane behind a windshield can feel like a broad avenue on a bike, and what feels slow in a car feels fast to a biker. Advocacy for better bicycling facilities can come from a well-used bike share system. The report isn’t without its problems. The draft plan doesn’t adjust the projected level of usage over time which, frankly, doesn’t make sense. People will use the system more as more stations become available and as people get used to the idea of bike share. It looks like they copied the final station proximity numbers into Phase 1 and Phase 2 but kept the introductory usage numbers for each phase. It would be good to get that sorted out. The first phase includes only one station in Novato, a small loner in the middle of downtown more than an hour from the next nearest station. Though it is census area with the most bike commuters in the county (6.1 percent! ), it doesn’t make sense to add only one station. Riders who arrive and find the station full will be stranded in the middle of nowhere with the clock ticking on their bike. Stations in Tiburon and Mill Valley are similarly isolated. There are missed opportunities for new stations in San Anselmo and Mill Valley. In San Anselmo, the commercial centers along Center, namely Yolanda Station and Lansdale Station, should be quality sites for infill. Miller Avenue at La Goma and Tam High should score higher as places for expansion. It is a true shame that College of Marin doesn’t get a station until Phase 2. Young people form the core of any bike share program. Leaving out a major destination for them until later in the program is foolish in the extreme. One of the more isolated stations – Novato or Tiburon – should be placed there instead. Bike share is sweeping the nation. It is transforming cities across the country and will soon reach the Bay Area. Marin should not get swept up in the trends for their own sake, and I’m glad the county is proceeding with caution. The next phase of planning is another baby step – $25,000 to find sponsors and study the potential subscriber base, which will put more flesh on the report’s bones. If Marin’s system does pan out, it will mean bike share is far more flexible than the high-density systems that launched the wave. That means suburbs like Marin, from Surrey, BC, to Staten Island, NY, will have an example of a functional system to hold up as an example. The good news for Marin, then, would mean good news for the country. A new commuter program from the City of San Rafael aims to draw municipal workers away from driving alone to work. Though it needs work to encourage active commute options, namely bicycling and walking, it will do wonders to promote transit and vanpool commutes. After two months of carpooling, participants will receive a one-time stipend of $50 and be eligible for quarterly raffles. Those who lease a van for a vanpool get $600 in help on top of TAM’s $3,600 vanpool subsidy. After six months participation, vanpoolers get a one-time stipend of $200. Prime parking spaces for carpools and vanpools. Public transit riders get a $20 “try it” transit voucher. A free Clipper card with $20 pre-loaded or a one month SCT pass might be a better way to encourage use. Use up to $240 per month in your pre-tax paycheck dollars for vanpool and public transit. It’s unclear if the $75 state transit benefit is included in the package. For each trip made using an alternative mode of transportation, get a raffle entry. This includes bicycling and walking. Drivers also get a $100 subsidy towards the purchase of an electric vehicle. You can read more about all the programs on San Rafael’s website. At first glance, there’s a fair amount of emphasis on encouraging these modes without a lot of emphasis on subsidizing them after the fact. This makes some sense, as people tend to stick with the transportation mode they’re used to rather than switch to another one. After six months of vanpooling, I suspect the routine will be established well enough that it just won’t occur to people to switch. The focus on start-up costs could be applied to biking as well. I’ll bet a number of employees live within biking distance, but their bikes sit gathering dust and rust in the garage. There are also safety issues, like bicycle lights, that might not be available to the casual daylight biker. The city could offer to pay for the cost of a bike tune-up and lights or sponsor bike clinics at City Hall and Courthouse Square. Though not part of the formal program as it should be, this kind of bicycle benefit might end up as part of Bike to Work Day events, so bikes won’t be entirely sidelined. Walkers are harder to subsidize, as shoes don’t typically wear out so quickly. However, a one-time financial reward or a $50 gift card to a local shoe shop could be enough to get some people out on the sidewalks. Given how intransigent San Rafael can be when it comes to biking and walking issues, especially through downtown, getting staff on their feet and in bicycle seats could subtly shift the overall stance of the city. Woodbury told me that they have a limited budget for this pilot program, and money could shift if people don’t embrace a particular mode. Biking, she said, might end up as one of the beneficiaries if the interest is there. So far, unfortunately, interest in general has been fairly slow. Two weeks in, Woodbury is the only one to use the transit benefit, for example. She told me the group who devised the plan will be meeting soon to discuss marketing and outreach, so it may be a few months before things start to really roll. Programs like this one helps move people towards the diversity of transportation options available to them. It benefits the health of employees, boosts transit ridership, and helps the environment all at once. Here’s hoping the city as employer will lead the city as government to do a better job promoting its position as the relatively transit-rich center of the county that it is. Last week, Systemic Failure called out the Greenbrae Interchange Project as a waste of money when we already have an under-funded rail project not far away. Why spend $143 million on a road project that won’t even add capacity? While the Greenbrae project isn’t the best project, it’s about rearranging ramps, not adding capacity. While the Drunk Engineer is a great watchdog of Bay Area transportation policy, he’s looking at the wrong project. For that, we need to look a bit further north, to the billion-dollar freeway investment underway in Sonoma. Let’s step way back to two things, money and problems, and restrict our potential solutions to roads and rail. Fresh on our desk is a dictate from The Man saying the transportation system between Windsor and Larkspur doesn’t have enough capacity to meet the demand for travel, and we have $1.4 billion ($1 billion from roads, $404 million from rail) available to fix it. Adding two carpool lanes for the length of freeway that currently doesn’t have any will cost $1 billion, we know, and will add about 4,000 people per hour worth of capacity through the area. We can add about another 1,000 with a $500 million rail project*, but we can’t afford it, so we’ll truncate our line at San Rafael and Santa Rosa. What if we pumped all $1.4 billion into the road? Lanes only have so much capacity, and that decreases as the freeways get wider. We might be able to add travel lanes at the most congested part of the road, but all the merging could just gum up the works more. What if we flipped all $1.4 billion into rail? As it turns out, this would give us almost as much capacity. 7.5 minute service with three-car trains: $1.2 billion, 3,936 passengers per hour or 5,280 with standees**. If SMART were to get a clearance from the FRA to run European trains, the cost of 7.5 minute service drops to $1 billion, leaving us with $400 million to spend on years of operations, grade separations from traffic, or a 10-mile extension to Richmond’s BART and Amtrak station. Success! Not only did we meet our goal, we added capacity much further north and south than the 101 project and have some money left over for other projects. That’s pretty damn good. Alas, this is not how we do things. Instead, we’re spending 40% more money than we need to for a worse transportation product. That the most efficient project, SMART, cries poverty – much of its own making, true – is even more egregious. All the while, local and state authorities pump almost double the cost of the entire project for parallel road capacity. Rather than a truly transformative investment, SMART will be relegated to only a shadow of its potential. This is the height of what Cap’n Transit calls transportation myopia, and something that happens all the time in the Bay Area. Caltrans and MTC tend to see road capacity problems as vehicle problems rather than transportation problems. When they do take transit into consideration, they just duplicate efforts in parallel to the road project because they forget that transit a means of transportation, not a goal to be achieved on its own, and functions in competition to cars. That means that nobody takes SMART seriously as transportation in its own right. Even SMART views itself as a supplement to driving. MTC, TAM and SCTA need to cut off funding to the Highway 101 project and invest it in SMART. Caltrans is hunting for funds now, and none of these agencies should cough up the cash. Not only will the train add more capacity than the freeway, but it will also strengthen towns up and down the 101 corridor in a sustainable way, attract employers, and knit together the North Bay in a way a wider 101 never could. We spend so much energy in the North Bay talking about the environment. Let’s actually do something for the environment and save money in the process. *The cost of the IOS + Windsor is about $500 million. ** The maximum length of a train is limited by the size of a city block to three cars, so that’s how many we can put on a single train. The Sharryo train cars SMART will use have 82 seats with space for 28 standees, so a three-car train has space for 330 riders. The 7.5 minute headway is the minimum allowable without widening the Puerto Suello tunnel, and it means 8 trains per hour per direction. The cost of sidings to allow that much frequency is about $180 million more than the current system. Each Sharryo car costs $3.3 million, and 7.5 minute headways requires 34 trains. Add together the cost of 34 three-car trains and more sidings to the base cost of $680 million and you have about $1.2 billion. UPDATE: If you’re wondering where I got my costs, I detailed a double-track system here and a cheaper sidings-based system here. GGT’s bus ridership is sagging, but how to fix it? There’s no question about it: Golden Gate Transit ridership is in decline. But, as we cap off a year with two crazy days for transit (America’s Cup and the Giants parade), we should take a step back and look at where our ridership is going and, perhaps, how the situation might be improved. GGBHTD uses a July-June fiscal year, so we’ll be discussing projections for the rest of the 2013 fiscal year (last July to next June) as well as what has happened historically for the last few fiscal years. This confounds analysis. Federal data uses the federal fiscal year (October-September) while Census data uses the calendar year. If I switch into a different year, I’ll be sure to mention that in the text. As well, it takes about one month for GGT to audit bus ridership numbers, so December’s numbers haven’t been released. Nevertheless, today seems like as good a day as any to discuss ridership. GGT’s ridership has been dominated by bus services for a long, long time, but its share has shrunk significantly since 2002. In FY 2012, GGT carried 8.7 million passengers, roughly one quarter by ferry. Total ridership is down significantly from 2002, when GGT carried 10.8 million passengers – only one-sixth by ferry. All the losses have been borne by the bus segment of the system, which has seen annual declines in seven of the last ten years. In contrast, ferries have seen declines in only four of the last ten years, led by sometimes double-digit growth rates at Sausalito. These trends look set to continue in the current fiscal year. Bus ridership for the first half of FY 2013 is down 1.6 percent over the same period in 2012, while ferry ridership is up 8 percent. Intriguingly, this could be the first fiscal year that total ridership increases entirely on the strength of the ferries. Below is a normalized chart of ridership trends, with 2002 set as the baseline. Transit ridership normalized to the 2002 fiscal year. Ridership for the current fiscal year is a projection. Click to enlarge. 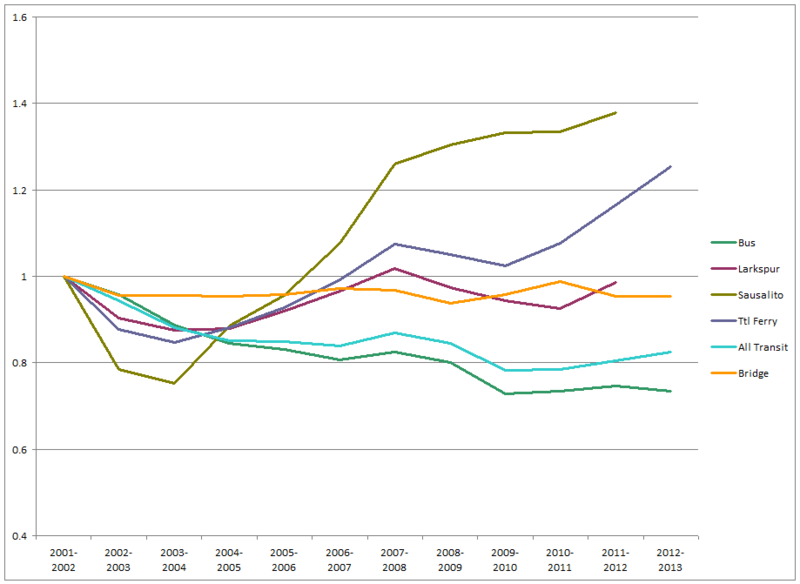 The most obvious trend is the decline from FY 2002 to FY 2004. In that time, San Francisco was still suffering the aftershocks of the tech bubble pop, which was compounded by the 2001-2002 recession. According to the Federal Transit Administration, ridership peaked in federal year 2001 at 11.6 million transit trips – 9.7 million by bus, 1.9 million by ferry. That’s also around when bridge crossings peaked, implying overall travel demand fell. This is borne out by census data. Since calendar year 2000, commutes by Marinites have fallen by about 6 percent. But this isn’t enough to account for the shift away from buses, which are down 32 percent. There must be structural reasons as well. Sure enough, that’s what we find. From 2002 to 2004, GGT dramatically restructured and cut its routing to cut costs, reducing its vehicle revenue miles (how far its buses travelled collecting fares over the year) by 32 percent. Over subsequent years, revenue miles increased only 1 percent. Though GGT projected only a 15 percent passenger decline, fare increases, competition from other non-car modes of transportation like bikes and ferries, and declines in commutes, overall took a toll. If bus ridership is going to increase again, GGBHTD needs to see itself as a single transportation agency. At the moment, bus schedules don’t link well with ferry departures, bridge tolls are too low to push people to bus usage, and timing-point schedules are hindering the development of high-frequency corridors. Most of these are actually revenue-raising measures, which could be pumped back into the bus system. Anyone riding Muni or AC Transit knows it is used for every errand under the sun, from commutes to groceries to getting to the airport. The front of the buses have center-facing seats reserved for seniors and the disabled, and passengers can exit out the rear door. In Muni’s case, they can enter that way, too. Yet, for whatever reason, GGT has chosen to keep its rear-door Clipper readers deactivated, forcing everyone to exit out the front. Navigating the system with anything that can’t fit on a lap is against bus policy. As well, the lack of level-boarding buses hinders the ability of seniors from using the buses. While the current bus configurations do keep the buses comfortable, it makes them less useful. Reforming these would make the bus more useful for everyday travel and speed boarding and alighting. Low-floor buses that provide level boarding could be the priority for all future bus acquisitions, rolling them into the regular capital replacement budget. While GGT does a fantastic job timing different bus lines, it does a miserable job coordinating with ferries. Route 29 to Larkspur Landing, for example, arrives 40 minutes before the next ferry departure. Part of this is Marin Transit’s fault, which times Route 29, but GGT could easily fix the problem, too. A shuttle between the Transit Center and Larkspur Ferry, say, would encourage people to take the bus to the ferry rather than drive. The total round trip, including layovers, would take about 25 minutes. This leaves 20 minutes of dead time between cycles, so this service could be added on to certain Route 23 or 35 buses, rebranded as 23F or 35F, which would save costs. Cost: $660,000 per year for new service, $340,000 for route extensions. I explored this concept in a previous post for ferry terminal parking, but it should apply to all park-and-ride lots that get full over the course of a typical day. This would accomplish two goals: to increase reliance on transit to get to transit, and free up spaces for midday travelers. Though some riders might abandon transit altogether, GGT would very likely see a net gain in ridership. As well, the parking fees collected could be pumped back into service, either for collector buses or for better frequency on selected corridors. The principal barrier to implementation is Caltrans, which controls the park & ride lots along the 101 corridor. Sacramento would probably need to intervene to force them to charge and to pass the money along to GGT. The ferry terminal lots, however, are controlled by GGT and could be priced now. Ideally this would paired with the ferry shuttles described above. Income: Variable, but likely in the low hundreds of thousands per year. Implementation would require a one-time capital investment for parking meters, ticket dispensers, etc. I discussed this concept in the past as well. A driver should pay just as much to cross the bridge as a bus rider. If we raise the base FasTrak toll to $7.20 and the congestion toll to $8.80 – the cost of going to San Francisco and back from Southern and Central Marin, respectively – the bus becomes a much more attractive alternative. A commuter would pay the same no matter which mode she chooses, so why not choose a bus? Cost: Political. Former San Rafael mayor Al Boro scuttled the last attempt at congestion pricing at the Golden Gate Bridge, and that was for a much more modest increase. Income: Significant. When congestion pricing on the Bridge was last analyzed it was part of a broader pricing scheme that saw a 12 percent drop in traffic coming in to San Francisco from all sources. If this holds true for the Bridge on its own, toll revenues would still go up, to the tune of about $50 million per year. If any of those drivers convert to busing, the income would be even higher. It’s a bit of cheating to get numbers up, as it opens up an entirely different market, but it could provide a good source of income. 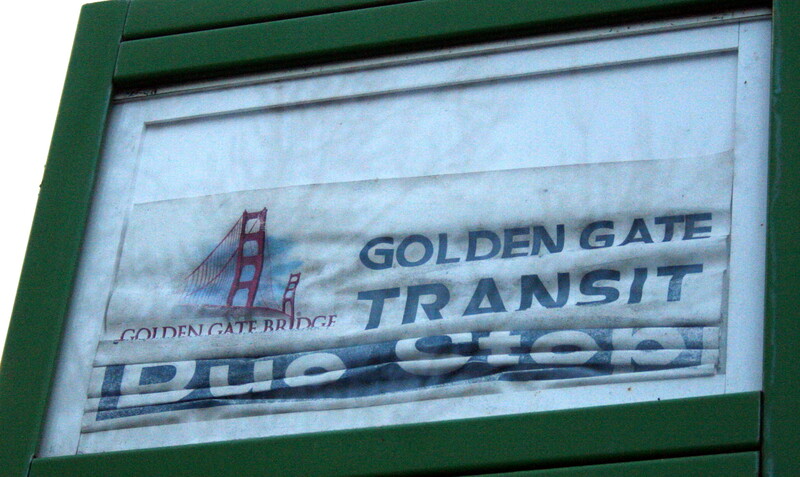 In San Francisco especially, GGT provides great redundant express service. The all-day lines (basic and Route 92) could pick up riders in-city, making that part of their journey more profitable. To do this, the boards of SFMTA and AC Transit would need to grant GGT permission to run routes through their territories. Given how much this may slow the San Francisco routes, especially Route 92, GGT may want to wait until the Van Ness and Geary BRT corridors are completed. Income: Unknown, but the alteration should only be made if the result would be revenue-positive. In short, GGT should make the bus convenient (suggestion 1), easy (suggestions 2 and 5), and financially attractive (suggestions 3 and 4). It should reinvest new revenues into increased service and better infrastructure, part of a virtuous circle of rising ridership and declining congestion. If Marin wants to be a green, environmentally-sustainable place, the bus must be part of the equation. Falling ridership isn’t a given, but it will take conscious steps to bring it back in step with ferry ridership. Light orange cells aren’t covered fully by the federal benefit but are covered by federal + state benefits. Dark orange cells aren’t fully covered by either. Lost in the madness of last night’s fiscal cliff vote were a slew of earmarks, including a provision reinstating the $240 transit tax benefit, and that’s fantastic news for Golden Gate Transit commuters. The new benefit means the total cost of all but the furthest trips will be covered by a federal tax benefit. 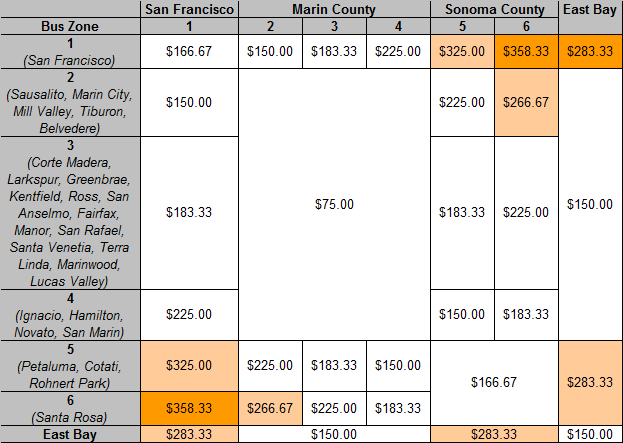 Those who are not fully covered – namely commuters between San Francisco/Southern Marin and Sonoma – will see more money in their pocket. If large employers tacked on California’s $75 transit benefit to the federal benefit, rather than overlapping the two, only the Santa Rosa-San Francisco commute will remain partially covered. Somehow, this benefit is retroactive to the start of 2012, though it’s unlikely anyone will be able to claim tax relief for those months gone by, as it’s unclear how that would work in reverse. This is the first time the transit benefit has been in alignment with the parallel $240 parking benefit. Though the old and expired $230 benefit approached the parking benefit, it still needlessly biased federal policy towards driving at the expense of transit. Alas, the benefit isn’t permanent. Unless Congress renews it, the benefit will revert back to its previous $125 level.